This Blue Jays season was a tale of two polar opposite emotions. The swing was so severe, I haven't been able to write about this team in quite some time. This will most likely be my last entry about the Jays this season. There was a point in May when I was literally giddy with the early season success of our ball club. We had the best winning percentage in the majors and there was a vibe this town hadn't felt since '93. Jays games on the telly became appointment viewing for me, I wanted to see every pitch live. Our Jays, I was sure, would be this year's Rays. We all know what happened next. A couple of big bats disappeared, our stellar 3rd baseman wanted out of town, my favourite starting pitcher was the subject of numerous trade rumours and Rios was literally given away. When the dust settled, we were a distant 4th place in the AL East. On Wednesday night, an announced crowd of 11,159 took in the third game of a four game series with the Minnesota Twins at the Rogers Centre. That's right, 11,159. I'll give you a moment to absorb that lowly number. There has never been that few bodies taking in a Jays game at the stadium formerly known as SkyDome. In my opinion, following a start that had this city buzzing, there has never been such total apathy toward our ball club. I planned to share several retro Jays songs this summer, but passed because I wasn't feeling it. A die-hard fan who followed every pitch from 1983 through 1993, I stopped watching completely. It all seems so hopeless and even the future looks grim. No reasonable person can see us making the playoffs any time soon while buried in the powerful AL East. I just want to put a fork in this 2009 season. It's done. I'm done. It's been all downhill since this glorious moment. It was evident the entire time that this start would never lead to a successful season. We didn't have the pitching and we didn't have the bats to win over a 162 game season. When looking at the rosters in the AL east it was so clear to me that we could never beat the three teams ahead of us. The same will be true next year. And two years from now. I have never stopped watching baseball and continue to love the sport. But i fear the time is coming soon when i will stop caring, because I can't see another 1992/93 happening again. 1994 (wow, it's been 15 years) left such a bad taste in my mouth that I abandoned Baseball. 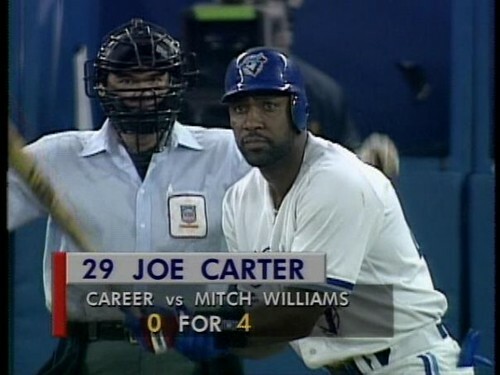 I've been to a couple of games on someone else's dime, but those are the only complete Jays games that I've seen since Carter knocked it out of the park. I've seen every home game this year (it's part of my job) and it's been a disaster since the road trip in May. They said 11K + on Tuesday - by my estimates, there might have been 11K + fans walk through the turnstiles, but they weren't sitting in the seats. It was so quiet in there, that if you listened to the broadcast mix at home on the TV, you could hear the radio broadcast on a delay from the concourse. Sad... and I get to do the last home stand too! I made my mistake... at the lake years ago, on my dime. Too much money grabbing at the Dome now for me. Gee, I can remember you could pack a lunch......and a six pack......go to the Time Out Restaurant... have a beer and bypass the beer security at the normal gates....and...Let's go Blue Jays!.. Let's!.. Play!...BALL! Baseball was my first love. Who you guys know as Toronto Mike I know as my big brother who taught me about baseball and the Jays. It stings it bit more every year. I am a die-hard Toronto Sports Fan but I don't feel the same pain with a Jays loss that I do when Leafs/Raps/TFC lose a game. I have tried to hide from the realization that Toronto is in a very difficult situation in a league run very poorly where the rich prosper and the poor drown. Take a lesson from the NFL. Look at how they run that league. A small market can compete any given year. I would never have said this 10 years ago but sadly ---- I would gladly trade the Jays right now for an NFL franchise. No questions asked. WOW. And to think.... baseball was my first love. It sure does sting. But Mike, it sure was fun 20 years ago!!! What a blast. They need a new GM, a new president (or extend Beeston) and Rogers needs to give this team a direction. There's been rumours from McCown and Jeff Blair that Rogers may raise payroll this offseason. Lets see what happens. The fans have been dormant here a while, but they would wake up if they felt this team might actually make the playoffs. Hey Ryan, do you really feel a sting when TFC loses? Yes, but in hindsight of writing that last post, not as much as when Leafs/Raps lose. But this year is the first year that i am feeling any pain with a TFC loss. So i thought i should mention them. Notice i did not mention the Argos? They are way way way way beneath the Jays. I think the good news will start flowing the day after the season ends when they fire JP....Have some faith Mike, they will have a new GM by October with a ton of Money to Spend in November/December.